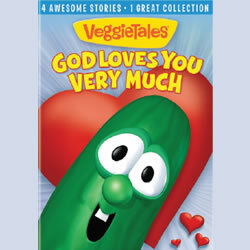 For the young ’uns in your life, there’s a new VeggieTales DVD in stores, God Loves You Very Much (Big Idea). This release, with nearly 90 minutes of familyfriendly content, features three classic VeggieTales stories that teach valuable lessons about love: Gideon: Tuba Warrior, The Ballad of Little Joe and Rack, Shack & Benny. The new package also includes the all-new song “Does He Love Me?” plus other bonus features and activities.